Monthly Reno Sparks MSA employment trends (year over year) have seen consistent positive employment growth since March 2012. August 2014 employment levels reached 203,300 (preliminary – not seasonally adjusted), a 2.4% increase (4,700 jobs) over August 2013. The August 2014 employment level was higher than for any August employment level since 2008. The August 2014 employment level of 203,300 represents an increase of 18,500 jobs since the lowest level of employment since 2005 (January 2011, 184,800 jobs), but remains 24,800 jobs shy of the region’s peak employment (December 2006, 228,100 jobs). The MSA unemployment rate in August 2014 of 6.9% was lower than the July 2014 rate of 7.3% and 9.2% in August 2013. The industries with the largest employment gains between August 2014 and August 2013 include Professional Services (3,000 jobs); Retail (800 jobs); Education & Health Services (600 jobs); Construction (600 jobs); Transportation, Warehousing, & Utilities (500 jobs); Leisure & Hospitality (200 jobs); and Financial Activities (100 jobs). Despite the downturn in Washoe County gaming industry’s performance in recent years, gaming remains an important employer and revenue generator. Of the top 20 employers in Washoe County, eight are Casino Hotels. 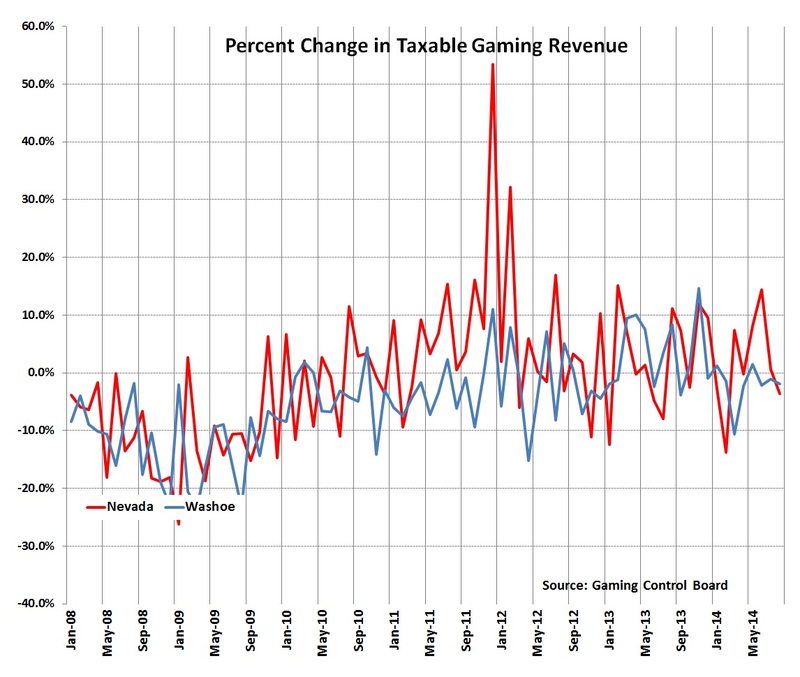 Washoe County gaming revenue fell by 1.9% between August 2014 and August 2013. For a full year September 2012-August 2013 and September 2013-August 2014, gaming revenue also fell by 0.80%. Revenue grew by 1.4% in May 2014 over May 2013, before again declining for three straight months. The highest amount of recent revenue growth was in November 2013, when revenues increased by 14.7% over November 2012. The highest recent revenue loss occurred in March 2014, when revenues decreased by 10.7% over March 2013. Local gaming industry first experienced negative gaming revenue growth in the 1st Quarter 2001 as it declined by 3.2% over 1st Quarter 2000. This coincided with the legalization of Las Vegas-style gaming in California. The negative growth lasted for eight quarters through the 4th Quarter 2002. Gaming revenues fluctuated between 2002 and 2007, until a 3.0% decline in the 3rd Quarter 2007 which started a 22-quarter negative growth trend which lasted through the 4th Quarter 2012. 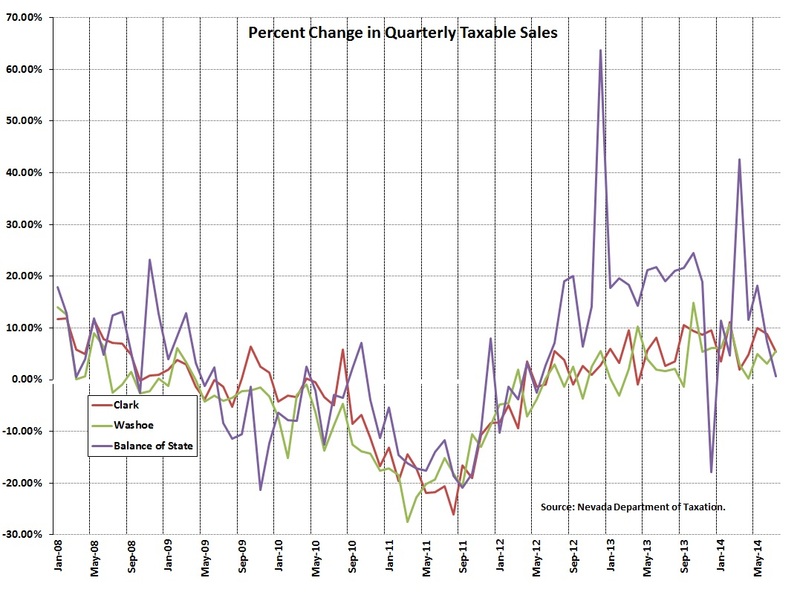 Washoe County taxable sales experienced positive growth in the last nineteen months between January 2013 and July 2014. Taxable revenues for a full year between August 2013-July 2014 increased by 9.2% over the previous period. Between July 2013 and July 2014, revenues increased by 6.5%. Taxable sales growth in the past nineteen months and lack of significant month to month decline since 2010 show a recovery in consumer and business spending, driven both by improving economy and growth in area population. The industries with the largest gains in taxable sales for the fiscal year 2014 (for those with greater than $50 million in sales) include Miscellaneous Manufacturing (+54%); Electronics & Appliance Stores (+41%); Nonstore Retailers (+38%); Professional, Scientific, & Technical Services (+33%); Specialty Trade Contractors (+22%); Durable Good Wholesalers (+21%); Furniture & Home Furnishing Stores (+14%); and Building Material & Garden Supplies (+14%). Food Services & Drinking Places continue to lead the industries in sales volume for fiscal year 2014 ($937 million), with Motor Vehicles & Auto Parts close behind ($876 million). Existing single-family median home value of $240,000 (2nd Quarter 2014) represents a 12% increase over the same period in 2013, and a 6% increase over the 1st Quarter of 2014. On a year over year basis, home values in the Reno-Sparks region have increased for the last nine quarters after decreasing for the previous 23 quarters from the peak of $350,000 in the 4th quarter of 2005. Average appreciation rates for the Reno-Sparks region (calculated between 1990 and 2001) are 1% per quarter and 4% per year. At this average appreciation rate, the median home value in the 2nd Quarter 2014 would have been $270,939. As a result, the current home value of $240,000 remains under-valued by almost $31,000, although comparison is somewhat skewed by the lack of homes currently sold in the higher price ranges compared to the mid-2000s. The greater Reno-Sparks region differs from Washoe County by eliminating Incline Village (Lake Tahoe) and rural parts of the county. Existing home values are significantly higher in Incline Village ($885,000 for 2nd Quarter 2014). Through August, the average number of new single-family home sales in 2014 was 79 per month after averaging 67 per month for the same period in 2013. 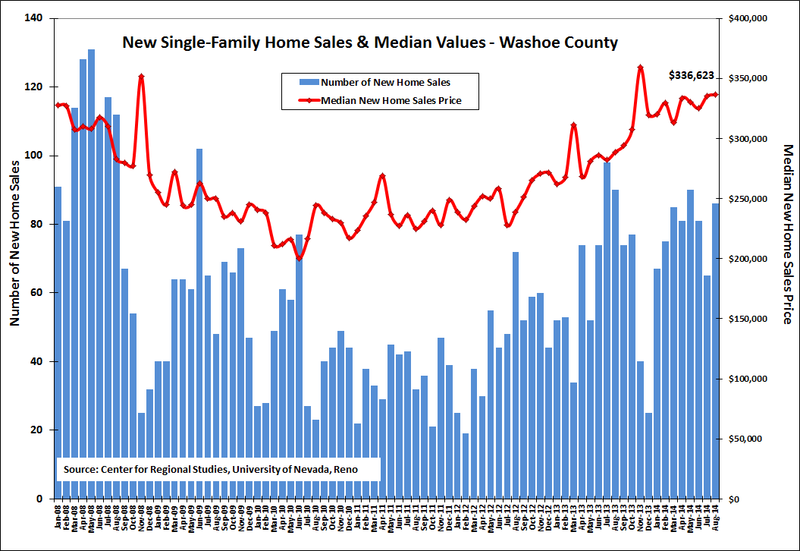 New single-family home sales in Washoe County remain below pre-recession levels, however, after peaking at 315 sales in November 2005. The median value for new single-family homes was up 17%, August over August, with the current value at $336,623. After peaking at $423,000 in February 2006, the highest median value reached $359,000 in November 2013. New single-family construction is reported countywide due to the insignificant amounts of new home construction outside of the Reno-Sparks region. The difference between the median sales price of all single family homes of $240,000 in the 2nd Quarter 2014 and approximately $325,673 for all new home sales in same period should be noted.